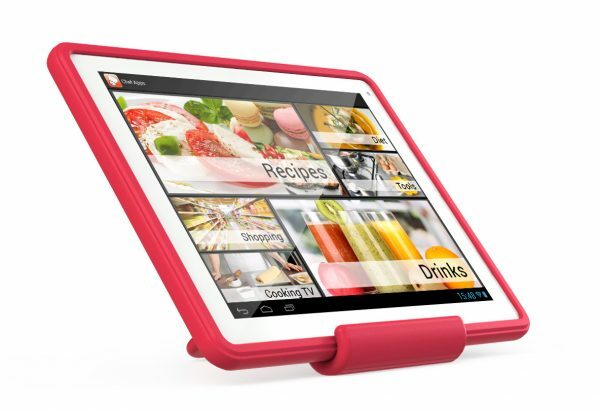 While all tablets show off their use in the kitchen, you don’t see many that are actually dedicated for kitchen use. Yeah, you get the occasional stand that thinks it does the job, but nothing really dedicated exists. 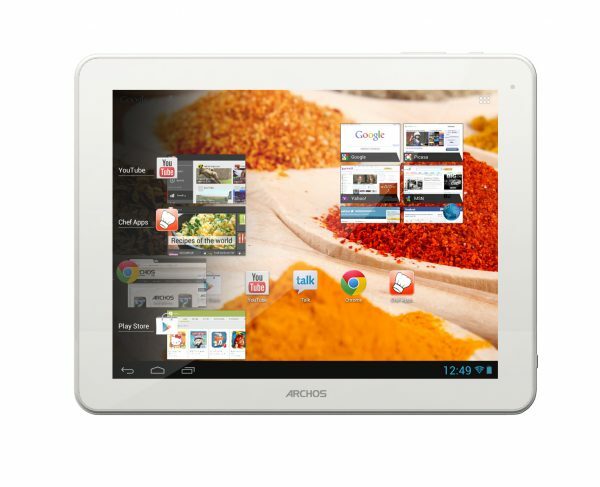 Archos have gone one ahead of everyone by producing a dedicated 10″ tablet for all you cooks out there. While the screen is still touch based, and yes it isn’t waterproof, it features a silicon case that lets you do a lot of your browsing without physically touching it. 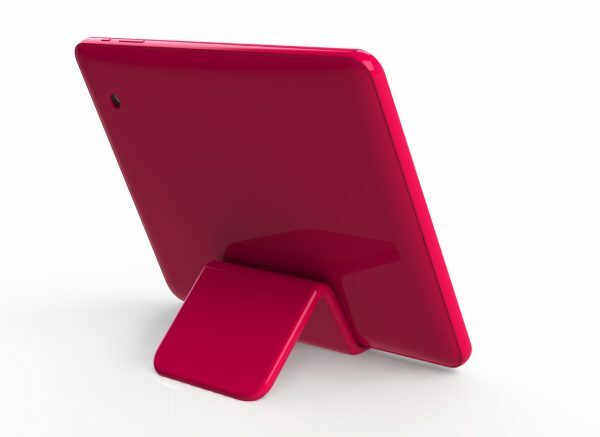 Also included is an adjustable silicon case, meaning you can perch and make it stand at whatever angle suits you best. On top of it all, it still is a regular Android tablet, running Jelly Bean OS, giving you all that you may want from a tablet. Ignoring the silicon case, this looks and feels like any other tablet. The white front is the colour Archos have gone with, and you can see a front camera as well. The back features another camera, and a rare Reset button. Don’t see many of those these days, and I am sure it has its uses, but we didn’t need it at all. The tablet does come with a dedicated charger. We are not big fans of that, but it isn’t all too uncommon when it comes to tablets. The top side features a dedicated BACK button as well as volume keys. With the case on, you have access to the power button, the charging port, the speakers, the camera on the back, and the back and volume buttons on the top. Using the back and the volume buttons, you should be able to browse through recipes, specially if you set the volume buttons to let you scroll through pages. The case itself is made of soft silicon, is nice to touch, and is sturdy enough to take a bit of pressure and flour while you’re cooking. It is also washable, so you can always clean it in the traditional way once done cooking. We must mention though, that the tablet itself is not waterproof, or resistant, and you should not be taking it too close to spillages. Also included is an adjustable Silicon stand, which does exactly what it says on the tin. A good touch by Archos to provide this, and we think more people should do that. So, what exactly makes this the ChefPad? It does not cook, of course. Interspersed are featured apps, which are all free. You can click on any of these apps, and you are then taken to the Play Store where you can install these apps. Once installed, you run them like any other app on any other tablet. Clicking on any of these categories takes you to more apps, within that category. Once again, you can install them and run them as you like. Some of these apps may have paid for recipes or collections/plans in them, while most of them are free. Also, the HDMI output means that you can play recipe videos on your television through this while you cook. Wait… PlayStore? So I can just install these apps without a dedicated tablet? While the true answer to that question is Yes, yes you can, there is more to it. I was sceptical about the whole idea, and my cynicism forced me to search on Play Store for these cooking apps. Sadly, the Play Store is full of games, and everything from ‘recipe’, ‘cooking’, ‘chef’, to ‘recipe apps’ gave me loads of games. Go ahead, try it. While the Play Store has a massive collection of cooking apps and such like, they are not all that easy to find, and you do get all that done for you with this. Of course, as time goes on, the ChefPad will need to update itself with the latest in apps. I have not seen any signs of this happening during the two weeks I have had a go with it. So, it helps me cook. Can I use it to play Angry Birds? Why yes. Don’t let the name ChefPad make you think it does the chef role and nothing else. Beneath that pile of spices lies just another tablet, with just the same features you want from most tablets. In fact, it offers a bit more, like a dedicated HDMI output so you can plug it in to your television, for playing games, watching movies and videos, and general tomfoolery. How does it rate as a standard tablet? This is bit of an unconventional product, which makes it a bit more difficult to form an opinion. While we rate it highly as a tablet, and it is actually really well priced for a 10 inch tablet, we are slightly scared of touching it with our grubby fingers while cooking. However, apart from making it waterproof and dishwasher friendly, Archos have done all they could do to make it kitchen friendly. What do you think? Previous story Hexbugs are ready for Easter!